When it comes to advanced mass marketed systems like cell phones and laptops and hybrid electric cars, the system designers of those products have taken appropriate steps to make them “safe” for uninformed end-user use. Purely mechanical unregulated ecig battery mods and uninformed end-users is a dicey proposition. Most consumer battery operated devices are no where near the limit of the battery’s operating limits. The high-end flashlights, remote control toys, and e-cigarettes come to mind as applications that can really push the limits of a battery. With the RC toys the device is physically far removed from the person so a mishap is inconsequential. With e-cigs a mishap is literally in the persons face. I’m going to be talking about “direct battery” mechanical mods, also known as “faux hybrid” mods, “hybrid-look” mods, or incorrectly known as “hybrid” mods. 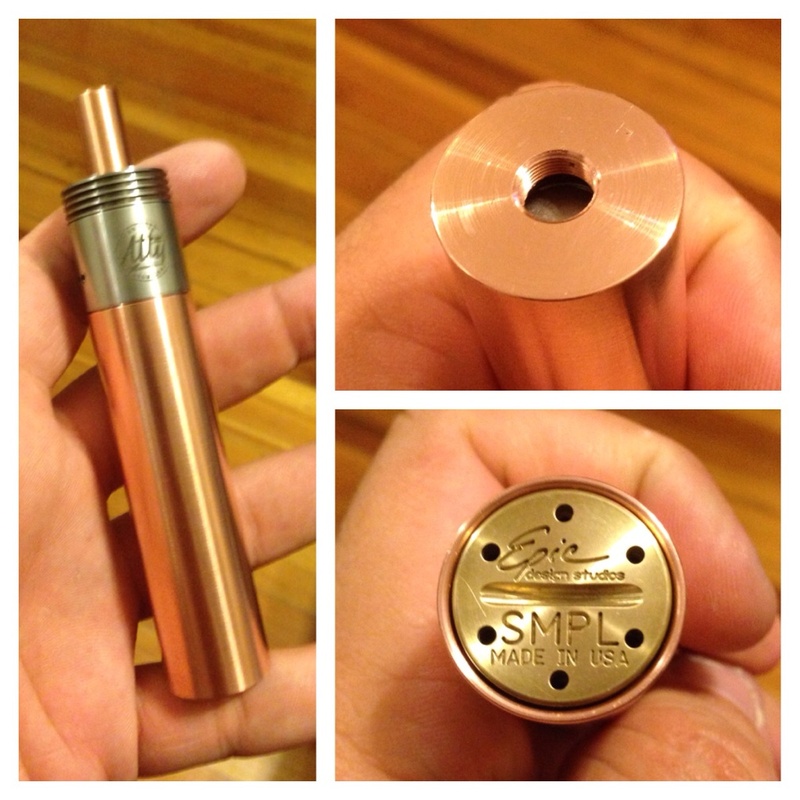 A “true hybrid” mod has a “dedicated” juice attachment, either an RBA permanently attached to the top cap, or an RBA with something other than a common 510 threading. 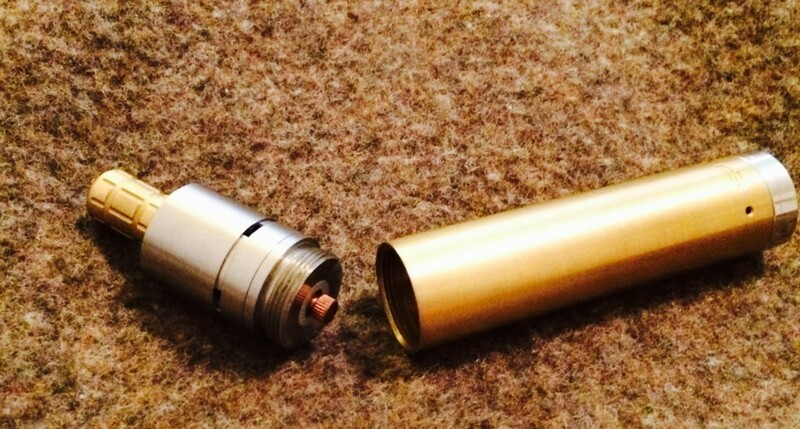 Below is a picture of a true hybrid: The atty has 20×1 threads, it attaches to the body of the mod, there is no top cap. 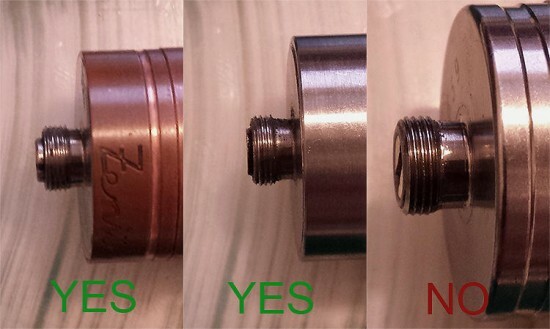 A direct battery mod will have no 510 center pin in the top cap. There will be 510 threading, but where the insulated center pin is normally found, you’ll only see the top of the battery. See the pic below of a SMPL direct battery mod; note there is no center pin in the upper right photo. There are also mechs which come with two types of top caps: one with a normal 510 center pin (left), and the other with the direct battery top cap (right). See pic below. These designs have become popular with the “cloud chasing” crowd, for whatever reasons. Users believe the absence of the insulated center pin will lower the voltage drop of the mech. However, without the proper knowledge or experience these mods can be potentially very dangerous to someone not familiar with their differences from other mechanicals. Using an incompatible juice attachment with a direct battery mod can cause the battery to go into thermal runaway. In other words, it can cause an explosion. A direct battery mod requires the use of an extended center pin in the 510 connector of the juice attachment to make safe and proper contact with the battery. Should the outer 510 connector (with the threading) make contact with the battery, a hard short will occur. Above: extended center pin on the two juice attachments on the left. Normal 510 connector without extended center pin on the right. It is believed that a disproportionate number of mech mod explosions have been from the uneducated use of a direct battery mod with a juice attachment with a common 510 connector without an extended center pin … whether that be a common clearomizer tank or RBA. — Lynn Lutz is into his fifth year of vaping, one of which included working in a vape shop for one year.